A mother who is, for a variety of reasons, unable or unwilling to care properly for her child or children has been the focus of several recent children's or young adult books. Wilson's Marigold in The Illustrated Mum is one such parent. To an adult reader it is soon apparent that Marigold is manic depressive, but this is only stated towards the end of the novel. In common with other novels with a similar theme and, as in life, it is the children who assume the role of carer and who struggle to keep the family together. Eleven-year-old Dolphin is the narrator and throughout the perspective of a somewhat confused child coping with a situation beyond her proper understanding is skilfully maintained. 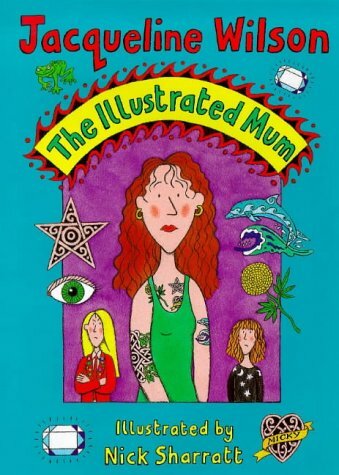 Dolphin and her thirteen-year-old sister Star, mindful of Marigold's horror stories of her own upbringing in a children's home, have developed a range of strategies enabling them to live in some semblance of a 'normal' family life. Some of these stragegies involve keeping Marigold's excesses under control, in particular her penchant for getting herself tattooed. When Star's father, Micky, reappears in Marigold's life and finds that he has a beautiful daughter it leaves Dolphin more isolated and neglected than ever, as Marigold focuses her attention on recapturing Micky's attention and Star is distracted by her newly found father. Bullied and misunderstood at school by pupils and teachers because of her neglected air and reading difficulties. Dolphin's only companion is Owly Morris, another outsider, and her refuge is the school library. With Owly's help she traces her own father. This is a development which could be considered somewhat extraneous, but no doubt is included to offer an element of hope at the conclusion, as he and Micky both provide support for Dolphin and Star when Marigold is eventually hospitalised and put on a course of lithium. Intended for older readers than is usual with Wilson's novels, this plot may seem grim, or even unsuitable. But there are many Dolphins living in our society, and stories like hers need to be told, not only so that children in her position may realise they are not alone, but also in the hope that others may realise that when a child is unkempt and seemingly uncared for there may be a reason. As always, Wilson's style keeps a degree of the grimness at a distance, and the love which Marigold has for her daughters and they for her is evident throughout the story. Sharratt's illustrations also provide a note of lightness and the cover will most certainly attract attention.